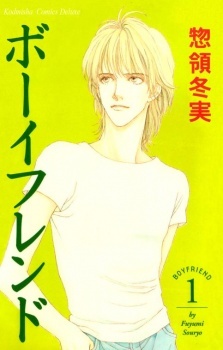 Boyfriend is one of the few shoujo manga that had a typical shoujo school romance plot, but goes much deeper than most. The summary of the manga is interesting, but it does not do justice to the actual story. Souryo Fuyumi depicts each character's personality and problems wonderfully. The art of this manga was pretty good, but some of the scenes looked slightly awkward, when the characters full bodies were shown. Nonetheless, the art improves greatly from the beginning, and suits the style of the mangaka. Much of the enjoyment of this manga stems from the intricate characters, like many of Souryo Fuyumi's other works. This manga is a beautiful and cute story that is extremely enjoyable, and gets you hooked. First off, this manga is from the 80s. so there is a difference in behaviour and societal norms depicted then in comparison to now. The story starts our fairly common, boy meets girl, something happens, they fall in love maybe, etc.... BUT! Its what is around the primary objective of just romance that makes this story different. The family situations, the past of the characters as well as their own thoughts/reflections. The way the story is told also makes the characters relatable to the reader. The pacing is relatively slow, sometimes things are omitted and some things may be seen differently today as they were back in 80s Japan. Some of these elements is for example how families were supposed to be, what was expected of girsl/boys in that time, what was seen as conforming to societal norms, what was seen as rebellious. As seen under this light the lead characters are both authentic and relatable. The hero is impulsive and abrasive at times, but he learns to open up to others and feel more connections to his classmates. The heroine is a typical "good girl" but not entirely. There are sides to her, that still feel honest and flawed as is necessary for a good reader connection. Overall i would recommend reading this Manga if you like the genre, appreciate good character writing and nice and fluffy 80s art style. I enjoyed it more than i thought i would as i continued reading it. When i reached the latest chapter, i was surprised i couldnt stop reading and wanted more.